Don't you love all these blue furnshings! 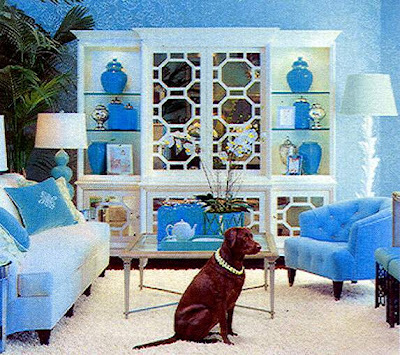 To see more of the first 3 photos of Grace Home Furnishings... go HERE. Be sure to visit more BLUE posts via Blue Monday posts over at Smiling Sal's and METAMORPHOSIS posts via Metamorphosis Monday posts over at Susan's!!! Oooooo and don't miss out of MY BIG SALE... 20.00 original paintings for 20 days!!! Ends July 15th!!! An ANNOUNCEMENT ABOUT MY PAINTINGS coming SOON! Love all your pretty blues! Wow, that chair's makeover looks great! 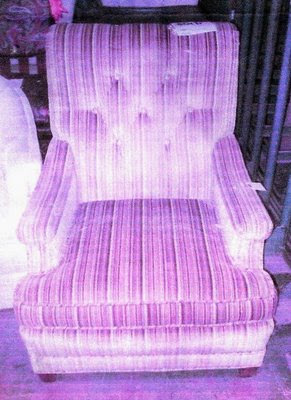 Oh I love that "after" chair...I wonder how hard it was to keep the lines of the fabric straight! What a job! Girl you have got some really fun talent stirring in you. Thanks so much for sharing! wish i could lie down on that bed. Have a Happy Blue Monday..
Those rooms are blue overloads! Happy Blue Monday. Oh Fifi. I never knew about Blue Monday. Blue is really one of my favourites and of course you do it so well!! I love all these rooms, but that chair metamorphosis is my favorite! Oh I love the stripes too! Very cute little chair! Totally love the room! The blue chair is a great mak-over! Happy Blue to you! Hi Fifi, all the pictures are completely gorgeous!!! Don't you just love that blue? Happy Blue Monday. Very nice shots! That bedroom looks very relaxing. i LOVE the second image. obsessed! Very pretty blues. You always have a pretty blog! I love the picture with the blue coffee set. The whole post is beautiful actually, great chair makeover. 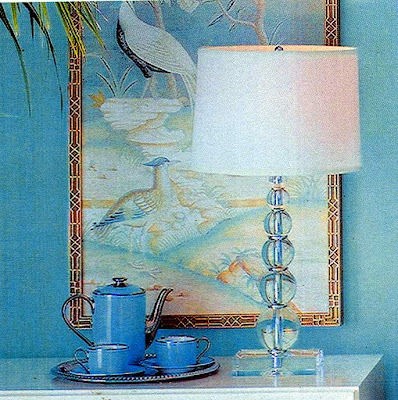 The decorator of those rooms had to do some searching to find those shades of blue. 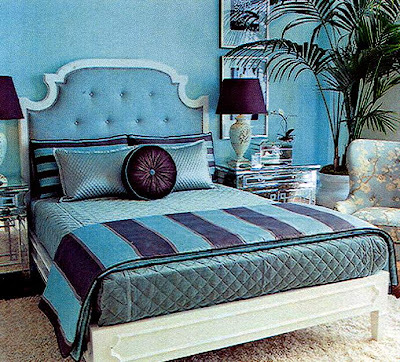 I love blue and have had a blue bedroom since I was a child. My choices have less intensity than the ones shown here. Love that painting on the wall behind the blue coffee set! Happy Blue Monday~~love those shades of blue!! I would say that is Tiffany Blue for sure. My fav color, besides pink of course. Happy Blue Monday. Your going to be a busy bee this week Miss. All the blue pictures are quite lovely and that chair makeover - wow!! Looks (almost) to pretty to sit on/in! Greatest color and post! I love the tiffany blue color...always my favorite! The blues are all so fabulous . Truly eye popping fun today. I adore the chair wow what a great makeover ! I am so glad to meet you through Sally's Blue Monday. Beautiful post and that chair, ooh la la! I love the blue room. How peaceful and soothing. Love all your pretty blue photos. Fifi that striped couch has my name all over it. Another fab post. SO looking forward to your guest post on Thursday and then another one. I'm so lucky! Those blues are gorgeous. That bed is calling to me. I feel like a nap is in order. Wow, lots of pretty blues here. Looking forward to tomorrow. LOVE the chair makeover...gorgeous fabric! As Picasso (He He) I also had my blue period, once I had a blue bedroom and the bathroom in a deeper shade. It was elegant and relaxing at the same time. Great pictures in your post. I love your paintings so much and want to have one done-just waiting till we get moved, settled and decide what I want done.